The design for this pin is inspired by the short cartoon Roller Coaster Rabbit. 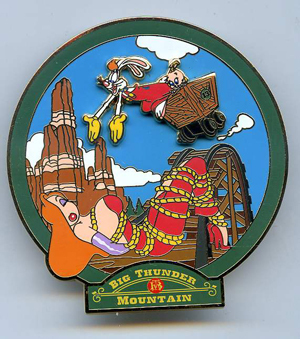 Roger and Baby Herman are in a wood cart on the Big Thunder Mountain ride and Roger has his arms stretched out to rescue Jessica. Jessica is tied to the tracks. There is a lot of print work on it such as the ride logo at the bottom in yellow and red, as well as Jessica's eye, lips and glove. Roger and Baby Herman also have printed elements on them such as their eyes and they are a second pin-on-pin layer.